last-mile logistics IN MEXICO CITY. Conduct site inventory to document key characteristics relevant to freight performance. Identify freight challenges and the context that contributed to the challenges. Understand the impact of road pedestrianization to local freight and businesses challenges. Propose potential design improvements that utilize existing infrastructure. 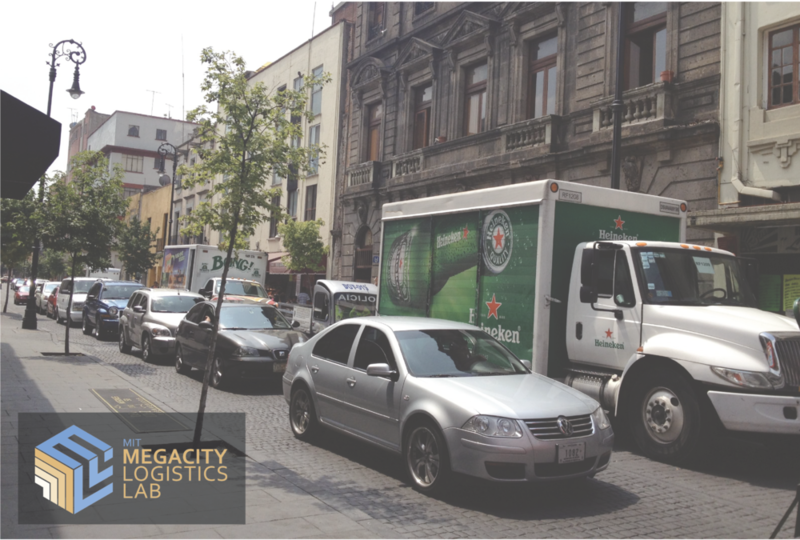 As a researcher of the KM2 project under MIT’s Megacity Logistics Lab, I collected logistics data relevant to delivery performance in Mexico City. The data was then uploaded to the KM2 Platform – an interactive map that displays logistics data of ten Megacities (cities with over ten million people). To the right, each circle represents one shop, and the radius of each point represents the width of the storefront (assuming similar shop depth). The screenshot is taken from http://lastmile.mit.edu/km2/show/Mexico/mexico-city/zocalo. Based on the site study and literature review, I hypothesized that the City's recent road pedestrianization effort may have a negative impact on freight efficiency and may worsen traffic on adjacent streets that allow automobile travel (vehicular street). To test my hypothesis, two surveys were carried out by local Mexico university students on-site. The students' background (trusted local institute), fluency in Spanish, and local knowledge have helped increase survey participation. According to Survey 1, the number of businesses increased after road pedestrianization. Survey 2 showed that roadway pedestrianization has had a negative impact on delivery efficiency. Taking into account the findings and Calle Mesones’ infrastructure, I proposed design improvement options which would reduce the traffic disruptions and pedestrian safety issues posed by existing freight activities. Due to time constraints , the thesis research did not involve insights or support from city officials in Mexico City. Connecting and getting comments from city officials will be critical to verify the legitimacy of research finding and design proposals.